1. How long will the blinds take? The majority of our blind products take between 5-10 working days from order to installation. Plantation Shutters take up to 12 weeks from order to installation. 2. How much do Plantation Shutters cost? Our starting range based on MDF composite wood starts at £325 per square meter however this can vary so its always best to get a full survey booked in beforehand. We work all over the North West. From the Wirral through to Huddersfield and from the Lakes down to Knutsford. 4. Are you DBS checked for school work? All our staff are fully DBS checked and qualified to work on school premises. 5. Are your blinds Fire retardant? We have an extensive range of Fire Retardant fabrics. All of our commercial blinds are specified as Fire Retardant as standard. 6. Can I wash my blinds? Although some fabrics from our extensive range of suppliers do say they can be washed, we would not recommend machine washing blinds. Most can be wiped with a damp cloth to clean them. 7. I am a Landlord, what are my responsibilities? As a landlord you have a duty to the tenants to ensure that the blinds are made to British Standards. Fire Retardancy is not a legal requirement however it is a choice for the landlord. 8. Where are your blinds made? Our blinds are mostly manufactured in the UK however we do have some suppliers in Ireland and in mainland Europe. 9. Do you have an environmental policy? Yes, please feel free to ask should you require the policy. 10. Are the blinds safe for my children/pets? Yes, all of our products are compliant with current child safety regulations and products requiring additional safety cleats are supplied with such. 11. Are you fully insured? Yes we are fully insured and underwritten and adhere to a strict health and safety policy which is under constant review to make sure we are always at the forefront of health and safety policy. 12. Why should I choose you? With over 15 years industry experience in both the residential and commercial market places we really know our blinds. Our friendly staff are extremely knowledgeable and are able to deal with your enquiries promptly. 13. Will the blinds fit in my bay windows? Yes, all our products are made to measure so this means we provide you with a beautiful bespoke product unique to your windows. Yes we do. We ethically dispose of all our waste in line with our own guidelines as well as government policy. 15. Do you have a social impact policy? Yes, this is available to read in full on our website. 16. Do you have a returns policy? All our products are guaranteed by a 12 month manufacturer promise and our fitting is covered for 36 months. We will always replace and rectify issues arising from manufacturer or installation error. We can not cover issues arising from incorrect usage or neglect. We are unable to accept returns for any other reasons that stated above. Yes, this is available to view on our website. Before we take any pictures of our work in your home or office, we will ask for your permission and authorisation signature. 18. Do I get a discount if I refer a friend? Yes, we have offers regularly available and they change frequently. Please enquire with a member of our team to find out which offers are currently available. 19. Will your blackout blinds cut out 100% of the light? Some products can offer 100% black out however others do not guarantee this. Please ask a member of our team for further details. 20. Do you supply the latest products? We are in contact with our suppliers on a daily basis and pride ourselves on offering the latest in blind technology along with the newest products. 21. 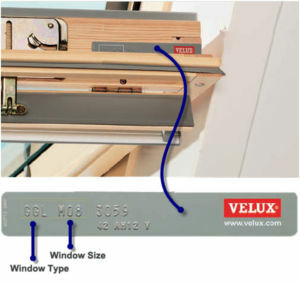 Where will I find the code on a velux blind? The code can be seen when the window is open and is visible on a plaque – as per the diagram below. 23. Do you have suitable blinds for a bathroom? As long as the bathroom is aired regularly most blinds are adequate, however a PVC blind is always good for the bathroom as it is easy to wipe clean. 24. Can you repair my blinds? Most blinds can be repaired depending on how old they are. Sometimes it is however more cost effective to replace them. 25. Do your blinds come with a warranty? All our residential blinds come with a 12 month warranty on moving parts. All blinds come with a 36 month guarantee on fitting. 26. Do you do motorised blinds? All blinds can now come motorised with the addition certain motors for certain blinds. 27. Can I control my blinds from an App? Yes, there are various ranges from different suppliers that are controlled by an app. We can also link some of these to voice controlled home assistants like Alexa for example. 28. What is the maximum sizes you do? We can supply and fit blinds up to 5m wide and in certain circumstances larger. We have a range of suppliers that specialise in large scale commercial blinds so we can cater for all requirements. 29. Do you have samples of the products? We have samples of all our products and can come to your home or business premises for you to view them. 30. How can we pay you a deposit? Deposits can be paid via BACS, cash, cheque or credit card.